The fourth of July dawned hot and ominous. The city was fizzing - ready to go off like a string of fire crackers. The big rumble was on. It would take Papa Arnold's Family far from their Brooklyn turf. Before the night was out they would have to fight their way home. They would confront the city's dangers, its violence, its mysteries. But, above all, they would stick together. They were brothers. The Family was the only family they had. Six warriors crouched in the shadow of a tomb. They were panting after their long run. The moon was shining above them; all the spaces between the gravestones and the tombs were bright but the shadows were hard and deep. 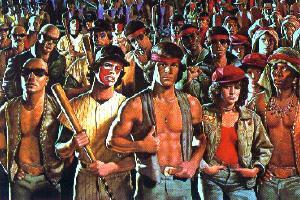 The Warriors was the best movie ever directed by Walter Hill and one of the greatest films ever made. It's certainly up there in the all-time top twenty. Now, most of Mr Hill's finest work is set in a world with virtually no room for women, a world in which men hang out together and bond, often by inflicting violence on other men. In other words, we're talking about gangs, which means that - by definition - this film has got to be the very essence of what he's all about. Because this is the ultimate gang movie. The New York depicted here is populated entirely by members of street gangs - each with their own uniform and absurd sense of tribal loyalty, and all determined to defend their turf against the next gang. A state of war exists between every group of youths in the whole city. Except that one gang leader has decided that if all the feuding factions would unite, then they would outnumber the police, outnumber those involved in organized crime and might - just might - be in a position to run the whole city. So he calls a summit meeting to be attended by representatives of all the gangs to explain his plan. Halfway through his speech, he's assassinated by a rogue madman. A false rumour promptly springs up that the murder was the work of a minor gang known as the Warriors, and the hunt is on to find the alleged killers. Unfortunately, the Warriors come from Coney Island. The summit was in the Bronx. It's a long way home. Through hostile territory. And that's your film, that is. A small group of youths making their way back to home ground, whilst every street they pass through is owned by a gang after their blood. It's simple, but hugely stylish. Hard to believe that you'll be able to resist its appeal. The first surprising thing about the book is how old it is - published fourteen years before the film emerged. The second surprising thing is how little was changed in order to make it into a movie for a different generation. Admittedly, the film made slight variations to the set-up, and certainly it distanced itself from reality - the gangs were kitted out in fantastically photogenic costumes - but the essence remained untouched. It's just that on the page, it's nowhere near as entertaining. Maybe if you're interested in gangs and take them seriously, it's okay, but for those of us who regard the whole concept of urban tribalism as being inherently absurd, a silly little juvenile diversion for testosterone-fuelled conscription-fodder, then the fantasy version on screen is much more satisfying than the somewhat dry text. Incidentally the film was promoted as being an update of Xenophon, so it's nice to find a few lines by Xenophon on the dedication page of the novel.